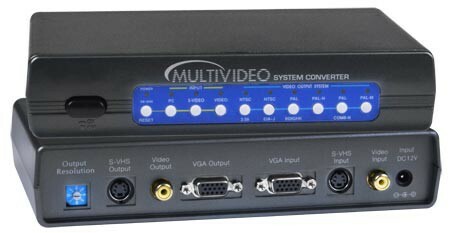 The MultiVideo System Converter allows the user to view computer video on a TV, or view TV/VCR/DVD video on a VGA computer monitor. This multi-format Video Converter also regenerates sync-pulses and can help stabilize weak video signals from multi-generation videotapes. Useful features include composite or SVHS selectable inputs and picture zooming. View any input signal at all three outputs simultaneously. Adjust output resolution using rotary switch. Under-scan an oversized image to fit the screen area of the TV monitor. Ideal for both business and personal entertainment. Play PC games on your TV. Watch VCD/DVDs, even record PC graphics onto videotape. Compatible with PCs or MAC with VGA output. Compatible with any TV set with s-video or composite video input connectors. Supports world video systems including NTSC/PAL/SECAM TV. Video input: 0.5Vp-p to 2Vp-p. Supports up to 1920x1200 video resolution. S-Video/Composite Video output to 1440x900. Color Subcarrier Frequency: NTSC 3.579545 Mhz / PAL 4.433619 Mhz / PAL-M 3.57611 Mhz / PAL-N 3.582056 Mhz. 6-foot (1.8-meter) composite video cable. 6-foot (1.8-meter) VGA male-male cable. Left Image: Convert NTSC/PAL SVHS video or Composite video to a NTSC/PAL TV and PC VGA monitor. Right Image: Convert PC VGA video to a NTSC/PAL TV and PC VGA monitor.